Links to Track, Road and XC Races. With local, hands-on coaching services, I'll assist you in improving your running form, work with you on drills and pacing, as well as including you in various group training runs and workouts. I also conduct Strength and Conditioning training sessions for student-athletes at all levels(grade school, high school, college). I work one-on-one with clients or in small groups and do health and wellness coaching, create individualized fitness programs, and set-up running programs for clients. I can also organize corporate wellness programs for schools and businesses. Please read the article on "wellness coaching" to better understand corporate wellness programs. I am based in Greensburg, PA and conduct training sessions throughout Western Pennsylvania as well as providing coaching services via the web for all Track & Field athletes. 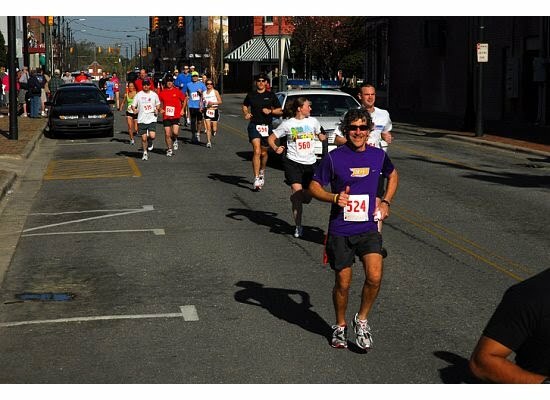 Greater Goldsboro 10K/APR09/2nd in age group. Judging the Kids' Healthy Snack Recipe contest/JUL10.